The First Time in Burkina Faso I Almost Died (According to No One Except Me) – Fila « Why did you click here? I immediately hit the deck, the deck being a red dirt dusty road. My bag of tomatoes got squished between my chest and the road, while I got a mouthful of dirt. As I had said, there was a 2/11th chance of perishing in Burkina Faso, but I was really hoping it wouldn’t be on my third day in village, the very first time I went out by myself (I had just gotten the place so clean!). I was still on the ground unsure what to do – those three months of Peace Corps training had not really prepared me for this situation. Should I roll around and do some ‘manvouers’ (whatever those might be)? Should I get up and run zig-zagging in the other direction? Should I throw my tomatoes in his face and charge? Even if I got away now this was not that big a village, surely he would find me later. Would I have to spend the next two years dodging bows & arrows? While calculating my next move, I began to hear a loud noise. A roar if you will. It was laughter, a ton and ton of laughter. I peaked my head up and saw that the entire town, everyone who had been sitting on either side of the road watching my every move, had continued to watch after I bought the tomatoes and now were laughing hysterically. This is an odd village I thought, how can what is happening be funnier than the Aw ni tile joke? I was a bit confused so I looked up some more, to see if my tormentor was still there. To my surprise he was laughing as well. It didn’t seem like my life was in immediate danger anymore, so I slowly stood up. The man I thought was going to be the last I ever saw was standing there, dressed in complete rags. He had knotty hair, and in between laughing was trying to sing a song. He wasn’t very good. But when I inspected him further, I realized the bow was indeed still in his possession, but he didn’t have an arrow. And he likely never did. Still a bit confused, I dusted myself off and tried to salvage what I could out of my tomatoes. A young man approached me, also laughing, but perhaps taking pity on me. “Il faut pas t’inquiéter, il est fou!” – or “Don’t worry, he is a crazy person!” That’s when I fully comprehended the situation. For whatever reason, just like dust and goats, many villages also have a crazy person – a fou (or sometimes a crazy women, a folle). The lack of mental health facilities probably doesn’t help, but they are harmless. Often they amble about, signing songs, telling tales – an almost jester sort of role at times. We had great moments with the one in our training village up north, actually he was quite an entertaining individual (he claimed he had asked the World Bank for 20,000 white people to build an international airport in his village of less than 200, and the four of us in training were the first to arrive – that meant he also considered himself to be our boss in a sort of way, and always carried around the hand-drawn blueprints of the prospective airport design to prove it). However, they are also crazy. And they do crazy things. And for some reason in this village, someone had decided to give this crazy fou a bow. Luckily, however, they had the foresight not to give him the accompanying arrow. This was all unbeknownst to me, but I was getting a quick education in it now. So I was alive, but my confidence completely shattered again, and no amount of tomatoes would bring it back. I meekly smiled and tried to say something to the fou. Of course he was laughing too hard and trying to sing when he wasn’t laughing, so it was tough to get anything through. Usually he made people laugh around the village, at least I was able to do the reverse to him. That and the entire village had finally stopped watching . . . no wait, that wasn’t true at all. It was a bit of an awkward situation, the kind I was desperately trying to avoid, so I resigned myself to failure and walked away off the main road and back to my house tomato-less. There’s no way everyone saw that right, I reckoned to myself. No one would remember that, the fou has probably pulled that trick on plenty of people. This is going to be ok, I bet people in this village hate to laugh. I spent the rest of that afternoon in my house, not leaving. My counterpart came over that afternoon, to recount the story of ‘The Fou and I,” that he had just heard. Oh well, looks like Day 4 was going to be another cleaning day! 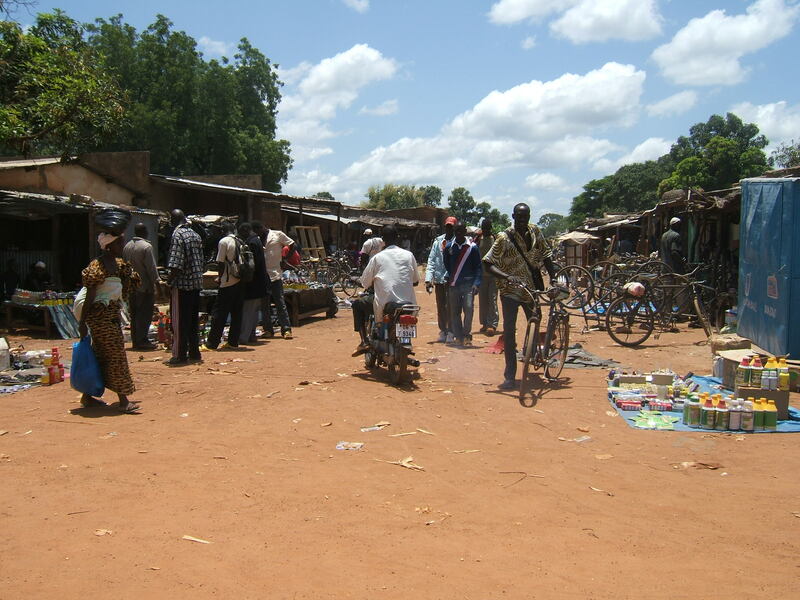 This entry was posted in Travel and tagged Burkina Faso.